European shares and a gauge of global equity markets closed down more than 1 percent, while losses on Wall Street fell nearly as much. Germany’s DAX index slid 2 percent. 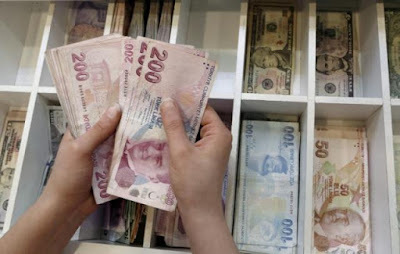 The lira fell as much as 18 percent against the dollar in its worst day since Turkey’s financial crisis of 2001. The plunge followed a deepening rift with the United States, worries about its own economy and lack of action from policymakers. The country is not a member of the European Union but is economically linked to it. The MSCI All-Country World index, which tracks shares in 47 countries, was down 1.19 percent and erased all its gains for the week. The Dow Jones Industrial Average fell 261.53 points, or 1.03 percent, to 25,247.7. The S&P 500 lost 25.67 points, or 0.90 percent, to 2,827.91 and the Nasdaq Composite dropped 64.41 points, or 0.82 percent, to 7,827.37. Investors piled into “safe” government debt, with German yields hitting three-week lows and the yield on the benchmark U.S. 10-year Treasury note falling to 2.8605 percent as investors sought its safety. The dollar index, which measures the greenback’s strength against a group of six major currencies, breached 96, taking it to its highest level since July 2017. It was last up 0.9 percent at 96.364. Emerging market stocks lost 1.77 percent, while the Mexican peso, a proxy for emerging market currencies, shed 1.63 percent to the dollar. Adding to emerging market currency woes was the Russian ruble, which weakened to 67.6825 to the dollar. Overnight it had retreated to its lowest since November 2016 on threats of new U.S. sanctions, weakening beyond the psychologically important 65-per-dollar threshold.